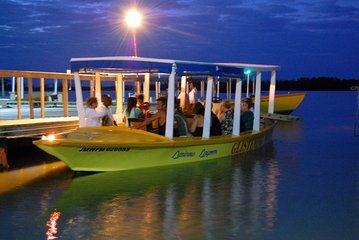 Besøg Luminous Lagoon, en af ​​Jamaicas mest berømte naturlige vidundere, under denne 4-timers aften aktivitet fra Montego Bay eller Grand Palladium. Bestyr en glasbåd og krydse ud over det glødende vand; tag dit badedragt til chancen for at svømme blandt det harmløse fytoplankton. Rundturstransport fra Montego Bay og Grand Palladium hoteller er inkluderet. This was a good tour but they pack a lot of people onto the boat. And it's not necessarily as exciting as you expect it to be. But it was cool to experience. The tour was acceptable. Boat was too full. It was too hard to get settled and then to get into the lagoon took a lot of effort for all people involved to get swimming. The boat driver and crew were great. The explained everything so we knew why the lagoon shined. I would go again if I knew there would not be so many people on the boat. The lagoon is beautiful... however you are on a TINY boat with a ton of people. Loved everything about this tour! Our driver was very friendly and professional, Once we arrived he made sure we were on the first tour heading out. Once we got on the boat our tour guide was very informative and nice as well, made sure everyone felt comfortable before getting in the water. Everyone was very pleasant, and the dancers were amazing! so worth it, loved every minute of this tour. Thank you! Tpur was nice , but full moon and no glass bottom boat. It was great! I would have given it five stars if we didn't have to wait for an hour before the tour actually starts.